Well, the answer is in the very question you’re asking! You’re STRESSED OUT, and that’s why you can’t speak fluently anymore! That’s it, my friend – stress is the single biggest reason affecting your fluency (and that of hundreds of thousands of other foreign English speakers worldwide!). … while at the same time you’re being fully aware of the fact that if you’re not in stressful situations, your spoken English level is fairly good. 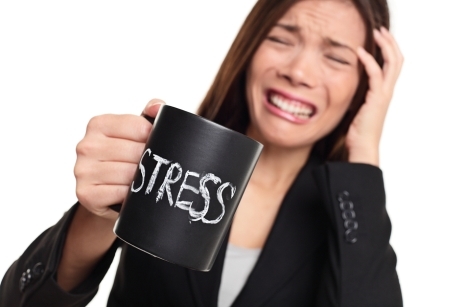 Why is it that stress affects our English fluency big time? Most people wouldn’t put language related performance into the same category as something that requires involvement of your entire body or certain body parts – such as playing a guitar, for example. Language related performance is largely seen as something belonging to the mental activity segment. Mathematics would be a typical example of a subject people would normally relate to an academic environment, and English language studies are traditionally perceived as something similar. You sit down at a school desk and learn stuff so that you can retrieve it later on from your memory, so English and Math are quite similar subjects if you look at it from this perspective, isn’t that right? Well, as far as your ability to write and construct English sentences on a piece of paper is concerned, I might agree. When speaking is involved, however, it’s a whole new ballgame altogether! When you speak, you USE YOUR SOUND PRODUCING MUSCLES (lips, tongue and other facial muscles) in order to produce speech in English, and when stress is involved, those muscles are prone to decrease their performance related abilities. Sure enough, even your mental performance may deteriorate in times of high stress, but the more “physical” the skill in question is, the more it’s going to be affected by stress. Let’s compare a few English language related activities and see how they stack up in terms of being prone to be affected by high stress levels. Listening to an English news broadcast and remembering its content. This is a 100% passive English language related activity for the simple reason that you don’t have to exert your brain to create any content on your own; you simply have to be paying enough attention to what’s being said for that content to sink in and being understood. Stress and anxiety has very little effect on your ability to listen and understand; no wonder the listening part in an English language test or an exam is the easiest one! Reading a short article in an English newspaper and remembering it. Unless you’re being attacked by some drunken stranger while reading a newspaper on a train, you won’t be having great difficulties retaining all that content in your brain for later retrieval. Sure enough, this activity requires a little bit more active involvement on your part; unlike listening it’s YOU who’s reading and it goes without saying that it’s also easier for you to be distracted and affected by stress while engaged in reading related activities. Creating written content on a specific topic in English. Now, while the two aforementioned activities were 100% passive (you’re only perceiving information as opposed to creating it), writing requires a whole lot more active involvement. When writing in English, you have to construct English sentences in your head and it’s pretty straightforward – the more stressed out you are, the more difficult it is for you to write properly. The more conscious you are of mistakes you might be making while writing, the more affected your written English will actually become. Still, your written performance is nowhere near as prone to stress attacks as your spoken English performance. When you write, you can always think of the right word to use and you can also swap words around and make sure your writing is decent by proofreading it; in other words writing has more to do with mental performance than the physical one. Speaking is 100% physical activity requiring your active involvement 100% of the time! No wonder most foreign English speakers are freaking out when it comes to the oral part in an English exam. While listening, reading and writing are relatively easy to manage in times of high stress, speaking in English is the one thing people always find hardest to manage when they’re stressed out. When you speak, you only have one shot at it. Yes, you can correct your own mistakes as you go along (as a matter of fact, I warmly suggest you do so! ), yet it’s not the same as writing where you can swap words around and proofread your written piece before submitting it to the teacher. When you speak, you pretty much have to think in English, and when you’re stressed out, your spoken performance levels are suffering for sure because your thinking becomes erratic.